If you are looking for an Amish bed that is beautiful in design and functional, the Amish English Shaker Spindle Storage Bed is the one! This solid wood bed is handcrafted to perfection with a shaker style that can add a sense of sophistication in any bedroom. There are six drawers in total under the bed for storage, three on each side. 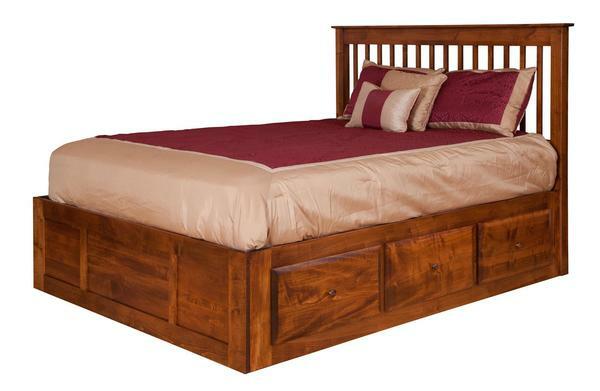 Select for your new Amish storage bed to made in a full, queen, or king size. Once your bed size is selected, you will have the option of choosing from six different hardwoods and a wide variety of finishes to match your style and bedroom decor. Shown in Brown Maple with OCS Michael's Finish.